Ask any RubberBanditos rubber ring wearer how much they love their active lifestyle ring, and undoubtedly hear nothing but jubilation. 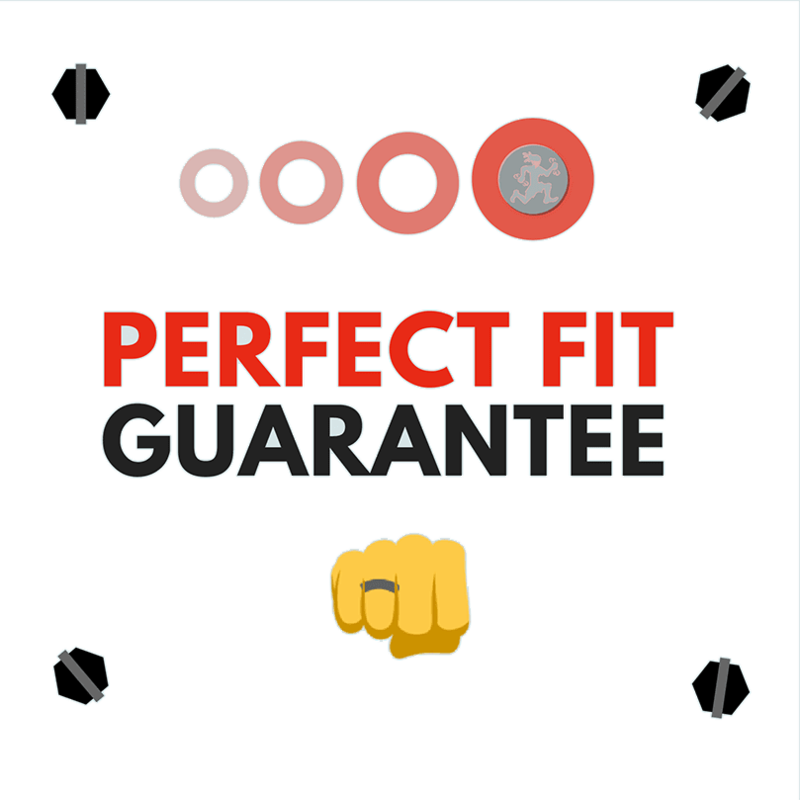 Our silicone rings are comfortable, durable, and modern, able to withstand even the toughest workouts without being damaged or causing discomfort. Although silicone wedding bands may not carry the same level of mental significance or price tag as traditional wedding bands, ours look the same as precious metals. 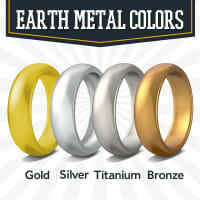 You can find our womens and mens silicone rings in a variety of colors and designs. 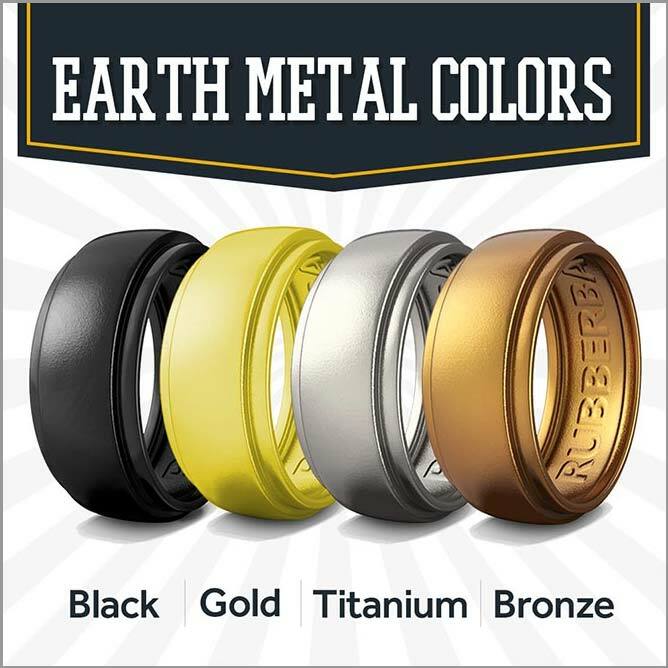 In fact, the metallic color is baked into our allergen-free silicone to give each rubber wedding ring an Earth metal appearance. 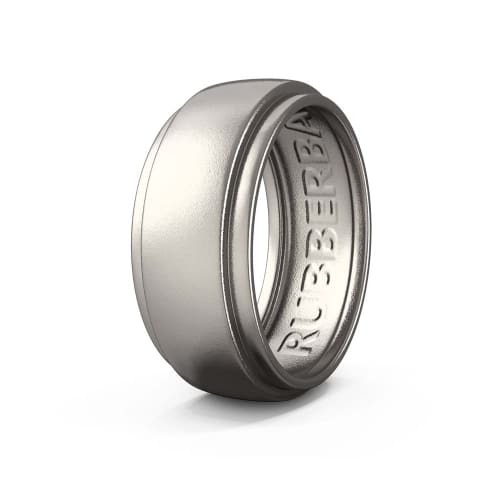 One of the best parts about getting a ring made of silicone is that you can wear your rubber wedding bands without worrying about damaging your diamond or scratching an expensive wedding band. 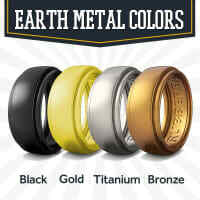 Workout, clean, hike, bike, or do any other activity you enjoy doing with these rubber wedding rings. No matter what kind of active lifestyle you may be living, rubber rings will be your perfect accessory. You don’t need a traditional wedding band to show your commitment. Enjoy your favorite activities with the comfort of our athletic wedding bands. 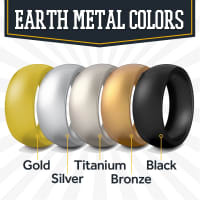 Created with durable silicone material, our wide range of active wedding bands offer both comfort and style for men and women. RubberBanditos feel better on your finger too, you’ll forget you’re even wearing a ring! Worrying about losing engagement rings, damaging a diamond wedding band, or suffering from a swollen ring finger are yesterday's problems. 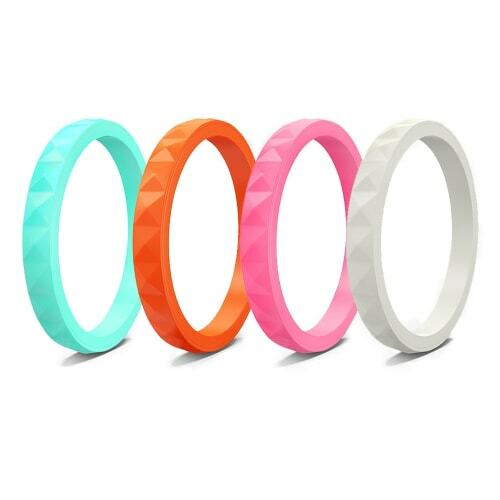 We’ve engineered the perfect silicone wedding rings that you can wear for workouts, work outside, or working it on the dance floor. 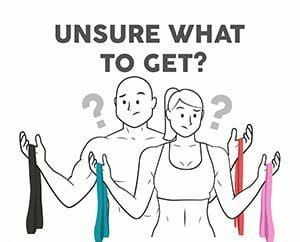 Why Should I Wear a Rubber Flexible Wedding Ring? Every year hundreds of people jam their fingers while wearing a ring and have to make painful decisions about what to do. Don’t be a statistic! They look great, feel great, and can be worn anywhere. If you lose it, get another one -- if you don’t like it or it doesn't’ fit, we’ll fix it! Save your money -- rings don’t compound interest and diamonds aren’t rare. A comfy ring that fits and suits you well is a worthy investment. 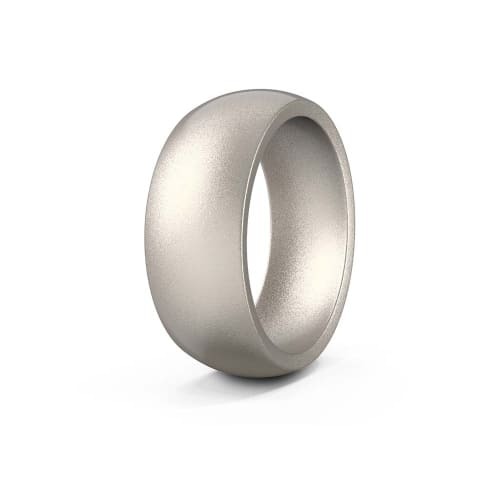 Which Silicon Rubber Wedding Band is Right for You? "Losing my wedding ring was one of the crappiest things that has ever happened to me, I was truly devastated. 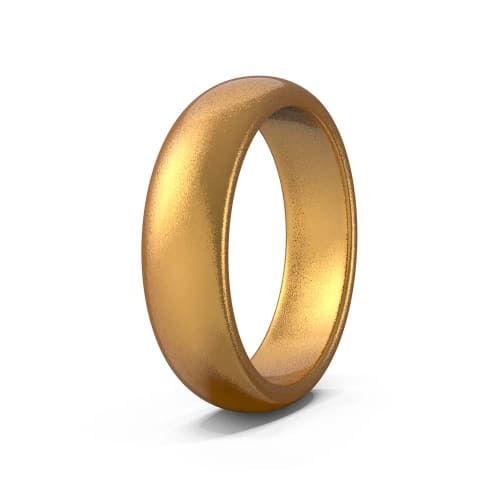 Fortunately, I discovered the RubberBanditos rubber gold wedding ring and was able to get one that looked like my original gold wedding ring to sub in temporarily [...] But I’ve loved it so much that it has become permanent." "I work with power tools every single day and have come too close to losing my ring finger because of my ring on a couple of occasions. My nephew bought me a silver rubber wedding ring for my birthday last year and I haven’t taken it off since"
"Working out is religion to me and I hate hate hate having to take of my ring every time. I had heard about rubber wedding bands and thought the idea was kitchy initially, but I decided to try it since the price was right. I was sure wrong!" "I bought my first silicone band about two years ago and immediately loved it. I just didn’t love how the color faded after 3 days. Bought another one, same thing. Then I bought a rubberbandito silicone band and the color has never faded."